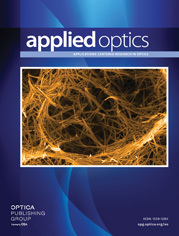 The authors are with Siemens AG, ZT KM 6 Otto Hahn Ring 6, D-81739, Munich, Germany. Laser-Doppler flow measurements with penetration depths from 10 to 30 mm have been performed on a layered model of the human head consisting of a regular array of capillaries with diameters of 340 µm embedded in an epoxy matrix with tissuelike scattering and absorption properties. Monte Carlo simulations and an analytical approach based on diffusing wave spectroscopy have corroborated the measurements and have led to a quantitative description of flow in deep-lying tissue layers with regard to layers near the surface also. The results indicate that it may be possible to measure changes in cortical blood flow even in the presence of a well-perfused scalp.